A multi-day workshop dedicated to bringing your music "From the Bedroom to the Stage." You'll learn a variety of ways to turn new sounds into songs and then how to get your music from your computer and into ears worldwide, plus ways to incorporate video into your live show without breaking the bank, as well as cost-saving techniques to build your own home studio, January 18-19, 2019 in Fort Collins, Colorado. Topics to discuss include sample selection, manipulation, and clearance so you can create beats on a budget, plus how to use samplers as instruments and not just to clip familiar parts of existing songs. Gain hands-on experience manipulating samples creatively to make new beats and create your own songs. Gain hands on experience mixing and layering sounds, as well as working with voice effects and harmony. Unique sound design is crucial to developing your distinct voice as an artist in the world of modern electronic music. Learn the basics of how to effectively operate a synthesizer in order to build your own sounds from scratch and step away from using presets. Get the answers you’ve been searching for during this live Ask Me Anything featuring certified Ableton trainer Zaak Kerstetter. Here’s your opportunity to get pointers from our multi-talented professors, catered to your instrument and ability level, as well as try new instruments. We’ll also review how to perform live to track. Pick up practical ways to bridge analog & digital worlds in the recording studio, including using music theory to clean up mixes, treating sounds with effects & processing, creating soundscapes with creative mixing techniques, and basic EQ & Compression. Acquire background and basics to generative and real time content production, plus an overview of live show control that will help you run your visuals from the stage. Chaos vs Control, in the Studio and as part of Performance. Live music & discussion in the Recital Hall. Topics to discuss include how to make sounds from scratch and without costly plug-ins, how to add dimension to your music without expensive and famed pieces of gear, and various ways to get creative for free. Audio effects are one of the best ways to customize your sounds. We will focus on several ways to process your sounds using serial effects, parallel processing, and return tracks to create diverse soundscapes. Gain further confidence in your inherent ability to make music beyond sampling by building major and minor chords, understanding intervals and how they form the major scale, and begin passable noisemaking with instruments. Topics to discuss include preparing for your musical journey, learning to embrace mistakes & how to pivot from them, plus knowing when to walk away from the knobs and call a project complete. How does the Music Modernization Act Affect You? A chance to get individualized feedback on your own musical projects from Michal, the band & special guests. Discover practical DIY steps to building your home studio affordably, including basic gear, room treatment, construction tips, and cheap alternatives, plus time and money saving shortcuts. You’ll be shown secrets to video content creation & high resolution workflow, plus networking for live event production. You’ll be our guests of honor to see Michal Menert & The Pretty Fantastics perform at the Aggie Theatre in Fort Collins along with Russ Liquid & more. Drummer Richard “Sleepy” Floyd, a founding member of the electronic trio Turbo Suit, is all about the groove. This creedence was instilled upon him by his long time instructor and mentor Johnny Lee Lane. A native of Kokomo, Indiana, this student of the groove pays homage to those who came before him as it resonates through his creativity and versatility. 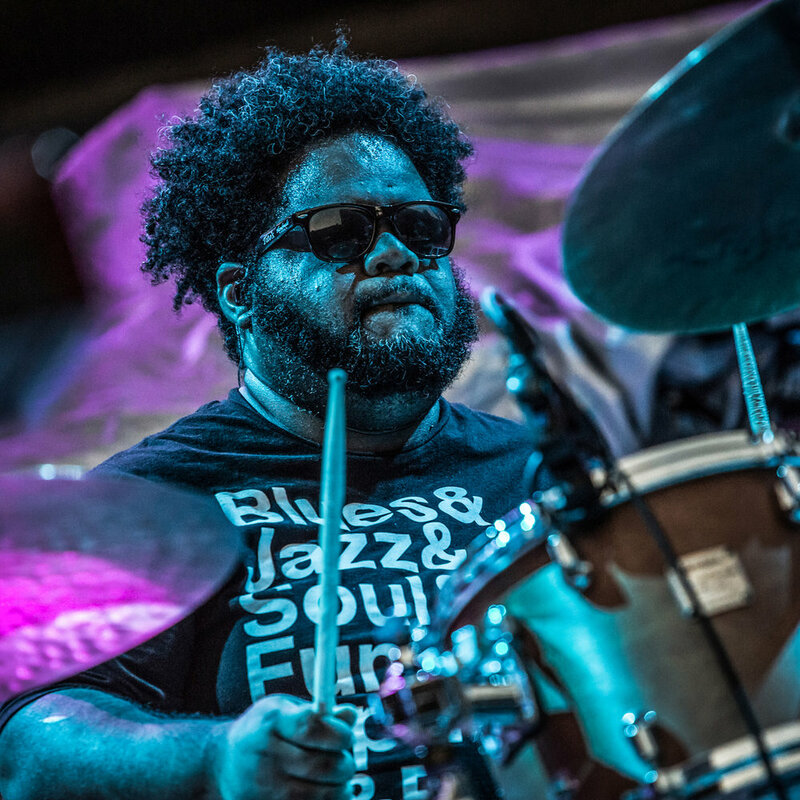 Often referred to as a “drummer’s drummer”, which speaks to the admiration from his peers, Sleepy has shared the stage or toured with the likes of Snarky Puppy, Ghost Note, Sy Smith, Lettuce, DJ Logic, and Break Science among many others, and also served as the Music Director for Super Bowl Village during Super Bowl XLVI, as well as for Elzhi, formerly of Slum Village. Nick Gerlach is an in-demand saxophonist, writer, and arranger who recently moved to Denver after studying and honing his craft in Indianapolis over the last decade as part of the band Turbo Suit. In addition to his work with the Pretty Fantastics, Nick has also recently played with respected artists like Ryan Adams, Thievery Corporation, Sunsquabi, and Manic Focus at festivals and high-profile venues all over the country. David Najarian is an audio visual artist who investigates the emotional experience related to polyrythmic collages of sound and light. Known best for his Iconic Pillar Stage designs and animations for Colorado's Derek Vincent Smith, David also directed and produced music videos and animations, engineered complex audio video playback networks, and designed interactive websites for Pretty Lights from 2009-2015. In addition to synesthetic stage design, David has been focused recently on the development of a new form of audio visual instrument which amalgamates the turntable and volumetric laser light beams and has been releasing music with his group 'Trophy Beats', often using samples lifted from records collected while traveling the the world with DJ Shadow as his video technician and systems network tech. He's also been an Ableton power user since the launch of the program. Other past collaborators include Bassnectar, DJ Shadow, Joey Badass, Krewella, Big Gigantic, Griz, The National, Odesza, & G-Easy. Julianne Thoma is a singer-songwriter and keyboardist based in Seattle, WA. Classically trained in piano and voice, her limitless range of musical interests/influences include jazz, electro-pop, R&B and UK bass. Julianne earned her bachelor’s degree in piano performance at Western Washington University (Bellingham, WA) in 2013, and alongside her vocal/instrumental background, she aspires to become equally proficient in synthesis, sampling and production. Julianne began working with Michal Menert and the Pretty Fantastics in August 2017. Matt Van Den Heuvel is a guitar player and producer from Seattle, WA. Having studied music from more than half his life, his interests vary greatly from blues and rock, to ambient music, to jazz, beats, synths, etc. With two solo album releases to date, Matt is ever active as a producer with current works exploring lush, acoustic driven ambience, space rock, and the blending of modern production tools with traditional instruments. Shortly after graduating with a music degree from Western Washington University he began collaborating with Michal Menert, and has been active in the band’s recordings and live performances since 2014. Jason “Schollaship” MacLeod is Michal Menert’s longtime sound designer and audio engineer for the Pretty Fantastics. His signature “Schollaphonic” sound brings extra life to Menert recordings like “Space Jazz”, “1”, & “From the Sea”. He’s also toured extensively with producer JMSN and has recorded Al Green. Guest lecturer Zaak Kerstetter is a Ableton certified trainer, DJ and artist who produces downtempo cinematic bass music under the alias Zenotope. Currently, Zaak is the program director and lead instructor of the Ableton Music Production (AMP) program at certified training center KMG in Boulder, Colorado. Zaak is also the organizer of the Boulder Ableton Live User group which holds monthly free meetings to grow the local Live community. When not teaching, Zaak is actively involved in producing and performing his original music and geeking out over his custom live performance setup. Guest lecturer Ken Abdo has served as legal counsel to artists, creators and businesses in music, film, TV, theater, media and publishing for over 30 years. His clients include prominent individuals, collaborators and businesses in the creative and commercial arts, including multiple Grammy® award recipients, gold and platinum recording artists, Emmy® and other award winners. His commitment to advocacy has vaulted him to national leadership positions with The Recording Academy, the American Bar Association and other organizations. Ken’s practice spans across all media and entertainment platforms. Harnessing his years of experience as a musician and entertainer, Ken has extensive experience working with developing, established and legacy artists as well as their estates.